LATROBE, Pa. — WIDIA, a global tooling leader and past sponsor of individual racers, including the No. 1 WIDIA Chevrolet driven by Earnhardt Ganassi Racing’s Jamie McMurray in the 2011 April Martinsville NASCAR race, now is sponsoring the Ultra 4 unlimited class racecar driven by David Buchberger for the 2012–2013 Ultra 4 season. With this development, WIDIA is sponsoring one of its own, since Buchberger also serves as vice president of Hi-Speed Corp. (Thousand Oaks, Calif.), a distributor of WIDIA-brand products and services. Ultra 4 racing is an exciting combination of high-speed desert racing and extremely hazardous rock crawling, all in the same vehicle. The defining characteristic of Ultra 4 class is that all cars must be capable of 4-wheel drive. Beyond that, the class is unlimited. All cars are custom-fabricated and come in all shapes and sizes. 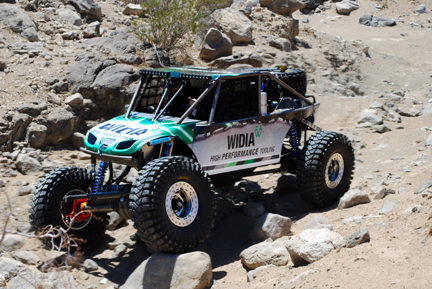 Each Ultra 4-class car is unique, attempting to straddle the line between light and quick for desert racing and stiff and strong for rock climbing. The Ultra 4 series includes the King of the Hammers race each February, dubbed the toughest race on the planet. Competitors must complete the 165-mile course in less than 14 hours. “The WIDIA sponsorship is a terrific boost, not only for the financial support, but for the tools that make these vehicle components possible,” Buchberger says.